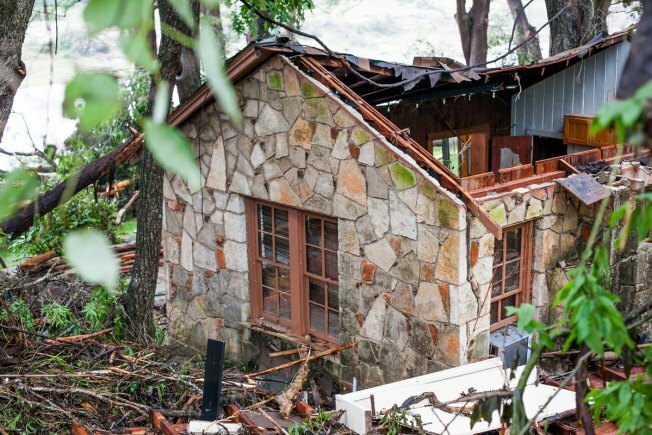 A house near the Blanco River sustained heavy damage May 26, 2015 in Wimberley, Texas. Some Central Texas families living in homes like these could be eligible for federal assistance. People in three Texas counties recovering from last month's devastating floods and tornadoes could be eligible for federal assistance. The Federal Emergency Management Agency on Tuesday urged residents of Hays, Harris and Van Zandt counties to consider applying. A May 29 presidential disaster declaration covers eligible families, individuals and business owners in those areas. San Marcos and Wimberley, in Hays County, and parts of Houston had deadly flooding. Two people were killed in a May 10 tornado in Van, in Van Zandt County. Residents can register online at disasterassistance.gov, use a smartphone or web-enabled device at m.fema.gov or call 1-800-621-3362. Every hour that goes by, water from Eagle Mountain Lake is inching closer to lakeside homes. Officials say eligible survivors should register even if they have insurance. FEMA does not duplicate insurance payments, but under-insured applicants could get government help after their claims are settled.